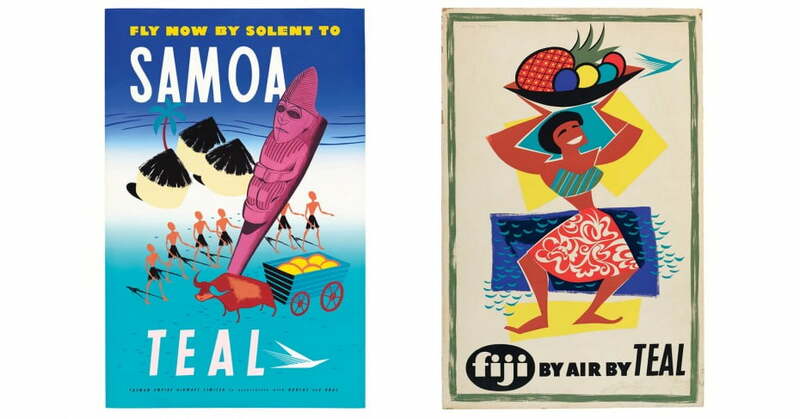 TEAL's early advertising posters depicted a blissful picture of the Pacific, with beautifully illustrated, highly stylised images crafted using the airline's corporate colours of blues and teals. The Coral Route connected big-city travellers from around the globe to idyllic tropical destinations in the Pacific. Based on RNZAF flight paths, the route took travellers between Auckland and Fiji, Samoa, Aitutaki, Rarotonga, and Papeete. Tourism was still in its infancy when the Coral Route was born. A one-of-a-kind experience, the flight stood for glamour and luxury in the skies. First launched in 1951, the flights saw a crew of five, including a chef, provide silver-service standard hospitality to 45 passengers. The service was a hit and within 6 months flights had doubled. In 1953, a TEAL Solent brought Sir Edmund Hillary back to his hometown and a hero's welcome following the ascent of Everest. Later in December 1953, Queen Elizabeth II flew TEAL when she toured the Pacific with her husband, Prince Philip. During her visit, the Queen flew a stretch of the Coral Route on Aotearoa II ZK-AML, a Solent flying boat, marking the first flight on a commercial airliner by members of the British Royal family. The fifties marked some exciting additions to TEAL and NAC's fleets. TEAL added three DC-6s in 1954 and several new trans-Tasman destinations, including Wellington, Christchurch, Brisbane and Melbourne. In 1947, NAC received the first jet-prop Lockheed Electra 10As. The first Vickers V807 Viscount in 1958 saw passengers flying above the turbulence. Then in 1959, TEAL's introduction of their first Lockheed L188C Electras signified a big step forward for the airline. Solent flying boats - with the exception of one for the Coral Route - were phased out in the late 1950s. The Coral Route connected Auckland to Fiji, Aitutaki, Rarotonga, Papeete and Samoa. As Papeete didn't have suitable airstrip, flying boats were used instead. Eventually competition and costs spelled the end for the Coral Route. In 1960, Aranui ZK-AMO, the last Solent was retired from the route, ending the world's last surviving scheduled international flying-boat service. Early crew uniforms were sophisticated and fashionable, strongly influenced by the industry's air force origins. Until 1961, TEAL uniforms were military style with all the trimmings, made by David Jones in Sydney. In true fifties style, the stewardesses' outfits were extremely tailored and fitted to complement the decade's emphasis on curves. The look was completed with matching black shoes, handbag, gloves and a cap. In fact, there were two uniforms - the crew changed to serve on board. For greeting passengers and landing, the summer dress uniform was khaki with a silk shirt, tan tie and shoes, and a beige cap. Once on board, stewardesses wore a white, stiffly starched uniform similar to a nurse's. This required very quick costume changes in a very confined space. NAC stewardesses also wore a military, nurse-style uniform during the 1950s. It featured gloves that were removed for service, and uniform handbags and briefcases that were proudly carried between flights.